Once you have a per-guest waiver configured for an inventory item, every booking that includes that item will also require guests to sign waivers. There are several ways to provide guests with waivers to sign. Waivers are presented on the confirmation page after checkout. If guest email addresses are collected during checkout, waivers are automatically emailed to them to sign. Otherwise they’re sent to the booking’s billing email address. Waivers can be signed from the order receipt. Once a guest digitally signs and submits a waiver using any of these methods, you can locate the signed waiver on the booking’s details page. A point-of-sale booking can be signed from the booking’s details page, via email, or via a custom link. To send a guest their waiver by email, navigate to the booking’s details pageor the daily manifest. 1. Locate the guest under Group Information or in the manifest. 2. Click the action button next to the guest. – If you haven’t entered an email address/SMS number for the guest, you’ll be prompted to do so now. 4. Click OK to send a link to the waiver. If you want a quick, easy way of displaying a waiver to your customers, you can also create a direct link. 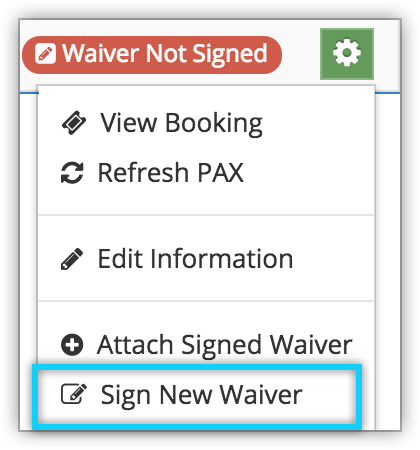 For example, if you want to keep a waiver up on a tablet computer for multiple customers to sign in succession, a waiver link is the easiest way to do so. Because these links aren’t connected to specific bookings, waivers signed in this manner need to be attached to their respective booking guests. This can be done at a later time. First, navigate to the item’s details page. This will provide you with links and a QR code that can be used to open the item’s waiver. You can also link to the waiver page directly at yourdomain.rezgo.com/waiver (replace “yourdomain” with your Rezgo subdomain). On the waiver page, customers can select whether to sign a general waiver — one without any item-specific content — or a waiver for a specific item. Once the waiver is signed, it will wait in an unattached waivers queue. To connect it to a guest, navigate to the booking’s details page. Under Group Information, you can see the guests who still need to sign. If guests are present and you don’t want to use a custom link, you can have them sign directly from this page. 1. Click the action button next to one of the guests who needs to sign. 2. Click Sign a New Waiver. Confirm if they are signing on behalf of a child. Fill out name, phone number, email address and birth date to confirm that they accept the terms of the waiver. Sign in the space provided. Depending on your device, you may want them to use their finger, a stylus, or a computer mouse. When viewing a day’s PAX in the daily manifest, you can see whether any still need waivers signed. If they do, click the action button next to the guest. 2. Click Sign New Waiver. For information on viewing and printing signed waivers, please read the article at this link.